Congratulations to Brian, who correctly identified Simo Häyhä as this past weekend's Person-of-Mystery. Not only did Brian identify Häyhä, but for added fun, he provided his reply in a cipher form. Way to go! 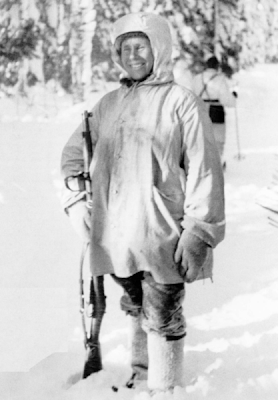 Simo Häyhä of Finland is considered by most to be the greatest sniper in military history with an astounding 505 confirmed kills. Finland was in a precarious situation at the outset of World War II. Having won its independence from Russia in the turmoil of 1917, the Bolsheviks were eager to regain the lands (Poland, Estonia, Latvia, Lithuania, & Finland) lost during the Revolution. The Molotov-Ribbentrop Pact (the Hitler-Stalin nonaggression agreement) provided the Russians the cover to invade Finland (as they had already successfully done a couple months earlier with Poland and the Baltic States). At his point, things were looking good for the Russians. 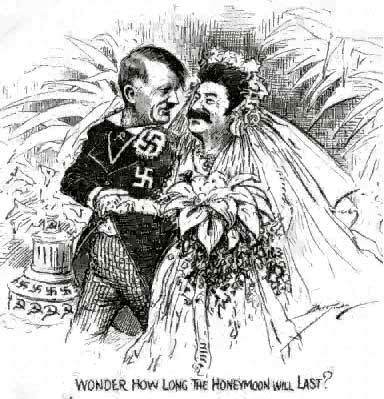 Stalin believed that Hitler was sincerely interested in avoiding war with the Soviet Union and after purging his army of disloyal officers, splitting Poland, and snatching the Baltics, Stalin believed it was time to grab Finland and perhaps time to officially join the Axis as the fourth power. So on November 30, 1939, the Soviets invaded Finland in what on paper should have been a cakewalk. 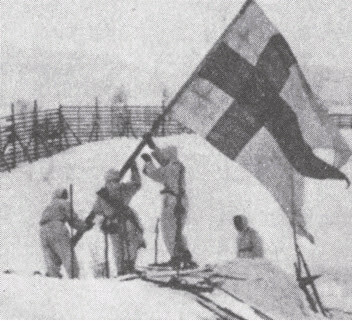 The Russians had nearly a million men to the fewer than 350,000 Finnish defenders. In addition, the Red Army had thousands of tanks and thousands of planes facing a paltry 114 Finnish aircraft and a measly 32 Finnish tanks. What they weren't counting on was the exceptionally cold weather and the fighting spirit of the Finnish defenders like Simo Häyhä. Things did not go well for the Russians. Their forces got bogged down in the frozen swamps and forests of the Karelian Isthmus and also in the remote Ladoga Karelia. The Finns were well prepared for the cold and snipers like Häyhä turned the forests into their hunting grounds. 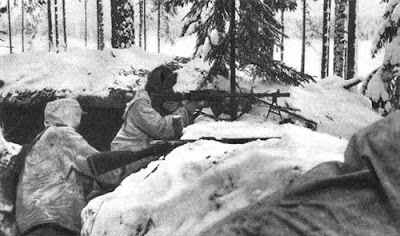 Häyhä was one such sniper who found himself at the Battle of Kollaa in the Karelia region. 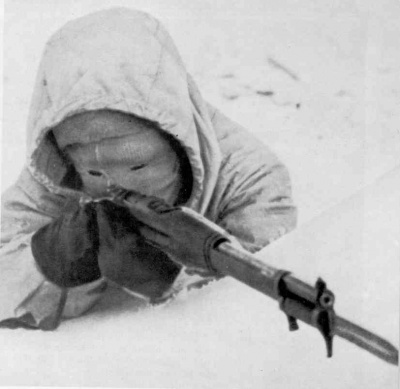 Most snipers use a rifle with a telescopic sight to help them see long distances, but the 5' 3" Häyhä preferred a variant of the Mosin-Nagant M/28 for it's shorter length and its iron sights which provided him a lower profile. He deftly picked off Russians day after day, to the point that the Red Army soldiers started calling Häyhä the "White Death." So deadly was Häyhä that the Russians at first dispatched teams of counter-snipers to hunt him, but after each successive group was was eliminated, the Russians ordered targeted artillery strikes against the White Death – nothing worked. Häyhä racked up an astounding 505 confirmed kills (37 more unconfirmed) and an additional 200 or so if you include his kills with a 9mm submachine gun. This unbelievable record is even more astounding when you consider he was only active for less than a hundred days with shortened winter light. 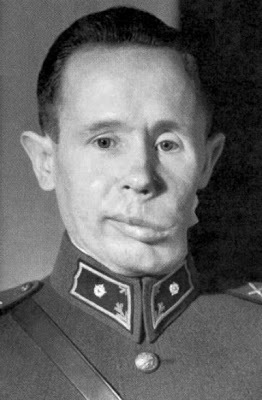 Eventually, Häyhä was wounded in combat by an explosive bullet that shattered his lower jaw. 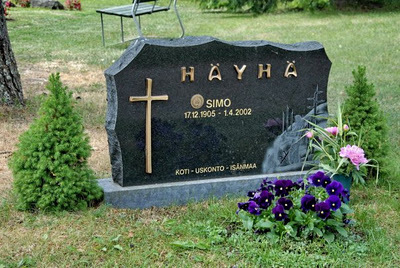 The Finns who recovered him reported that half his head was missing. 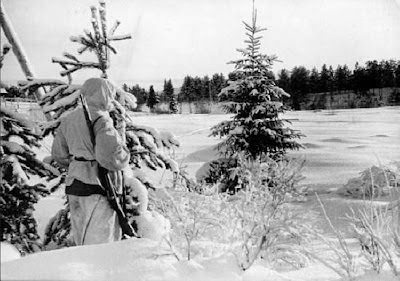 Remarkably, Häyhä regained consciousness a week later – the same day a peace treaty was signed with Russia). Häyhä recovered, but his war was over. He would live out his days as a professional hunter and dog breeder and died at the age of 97 in 2002. Finland's heroic defense against the Russians gave Hitler the mistaken impression that Russia was too weak to defend itself and encouraged Hitler in his plan to invade the Soviet Union the following year. So interesting. Isn't "Hai Ya!" sort of what kids yell when they attack their imaginary foes? The White Death. I wonder why they would give the enemy such a fearsome name. Why not something like 'sneaky guy in the woods' :) That would be a little less damaging to morale. I'm with you, Joel. Seems like the Red Army's PsyOps wasn't doing their job. At the end of those wars, the USSR sent away from the territories conquered from Finland an amount of 420,000 Finno-Ugric population (1/12 of all population in Finland, at that time), replaced with... nothing! Those lands had lost any connection with Finland and nowadays - except the town fo Viipuri renamend Vyborg - are almost abandoned. Give a look at http://prokarelia.net. Estonian Blogger, thanks for your comment. I've always found it sad how the Soviets attempted to remake the areas they controlled. good this complying with web link: BlueStacks for Windows. mobdroapp.meta.watch let us clarify its major buildings nice.